When told, the stories are almost always heartbreakingly similar: A black woman encounters substandard maternal care, resulting in a set of likely avoidable tragic consequences if only someone along the way had just given a damn. It’s not as if racial disparities in infant mortality are new. Back in 1850, when the US began keeping statistics about infant mortality, the black infant mortality rate was 340 per 1,000 while the white infant mortality rate was 217 per 1,000. 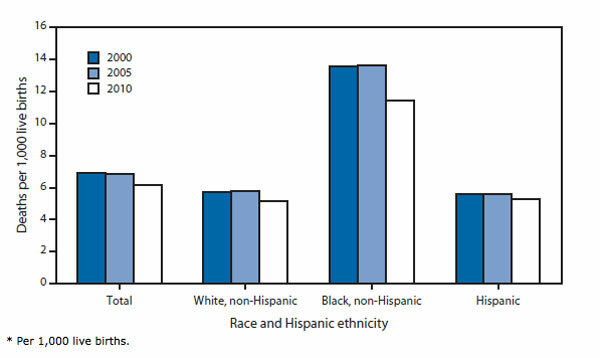 Fortunately, overall infant mortality rates have plummeted for both blacks and whites. But the ratio of black infant mortality to white infant mortality is greater today than in 1850. Not just the babies are at risk. According to statistics collected by the Centers for Disease Control and Prevention, from 2011–2014, black women died a rate over three times as high as white women during childbirth (40.0 deaths per 100,000 live births versus 12.4 deaths per 100,000 live births, respectively). The crisis of black maternal and infant mortality is a big factor in the country’s overall decline of our global ranking in infant mortality; the US was 12th among developed nations in 1960 and now ranks 32nd out of the 35 wealthiest nations. Translation? Iran and Libya have lower infant mortality rates than we do. The reasons for the black-white divide in both infant and maternal mortality have been debated by researchers and doctors for more than two decades. But recently there has been growing acceptance of what has largely been, for the medical establishment, a shocking idea: For black women in America, an inescapable atmosphere of societal and systemic racism can create a kind of toxic physiological stress, resulting in conditions—including hypertension and pre-eclampsia—that lead directly to higher rates of infant and maternal death. And that societal racism is further expressed in a pervasive, longstanding racial bias in health care—including the dismissal of legitimate concerns and symptoms—that can help explain poor birth outcomes even in the case of black women with the most advantages. And now, finally, lawmakers are beginning to react, with a blizzard of some 80 bills across the country addressing black maternal and infant mortality. Three states—California, Illinois, and Texas—are looking at racial bias in health care, ten more states have proposed bills expanding access to doula care (a doula, as NPQ has previously described, is a person trained to provide support to a mother before, during and after childbirth), and 19 more states are establishing task forces to investigate. But if the increasingly widely held belief that race-based stress is at least partly to blame is true, there remains a larger agenda to pursue that involves far more than the medical community. Eric Fullilove joined Relief International in 2018 as Chief Financial Officer. Eric is an MIT graduate, a Certified Public Accountant and a published author. He has had broad experience in the both the for-profit and nonprofit sectors. Eric has held leadership positions at organizations including World Vision, where he was global CFO with responsibility for Global Finance, IT, Supply Chain, Shared Services and Corporate Real Estate. He also has worked in a variety of organizations, including: Housing Works, a New York City provider of housing and services for people with AIDS and HIV; Teach for America, which provides teachers to under-resourced urban and rural school districts; and Boys and Girls Clubs of Santa Monica, which provides enrichment and leadership training for youth. Nearly ten years after the Affordable Care Act expanded access to breast pumps and pumping breaks, it’s past time to provide employees and clients with support for breastfeeding.